Kildare Firewood - Seasoned, quality firewood. Hardwood Ash Logs For Sale in Kildare. We are based in Kildare, where we grow, process and season our firewood. Having thinned the forests on our farm, the trunks of the trees have been cut and split by a firewood processing machine into logs of ideal size for either a stove, a boiler or an open fire. The trees harvested were Ash, Sycamore and Norway Spruce. Following the chopping process, the logs have been stored undercover in our sheds to season, resulting in a very low moisture content (in the region of 20%), making them ideal to burn right now. It is essential to burn firewood that is seasoned as firewood with higher moisture content causes a buildup of tar and soot in the chimney and it burns with much lower efficiency and increases smoke pollution. Our logs are sold in either a large “jumbo bag” or alternatively in a “barrow bag", which is easily manoeuvrable, using a sack trolley, to the rear of a house or apartment. For more information about bag sizes click here. Delivery can easily be arranged within a reasonable distance surrounding Naas in Co Kildare. 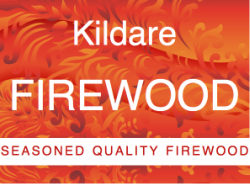 Click Here for news from Kildare about our firewood and special offers.